As part of Bob Stanley of Saint Etienne’s Pop Mavericks season at The Barbican, November 4 saw the premiere of two new documentary films by Paul Kelly – Take Three Girls: The Dolly Mixture Story and Lawrence of Belgravia, the latter about the eccentric Go-Kart Mozart, Denim and, most famously, Felt singer/songwriter Lawrence Hayward. Kelly himself is also a musician, playing in bands such as 80s Byrds botherers East Village with his brother Martin, and with his partner Dolly Mixture’s Debsey Wykes in Birdie. Both Kelly and Wykes have for many years been auxiliary members of Saint Etienne. To say there is nepotism afoot here is understating the case, but the members of Saint Etienne have always been fans of music and popular culture, and Bob Stanley in particular has tirelessly championed indie and 60s pop as a writer for music magazines such as Mojo, as the curator of events at the Barbican and the Southbank, and via his own record labels, even re-issuing the sole Dolly Mixture album in 1995. For the past few years he has been curating a film series at the Barbican, scouring the vaults (or scraping the barrel) to find the weirdest (Ladies and Gentlemen, The Fabulous Stains with Ray Winstone as a punk-rock star) and most wonderful (erm…) examples of the British pop music film. At times, the screenings seem more like cultural studies lectures on 70s youth cults and are often taken from the BBC’s Play for Today series and the like. The films are never very good but somehow always fascinating. However, although appearing under the same banner, the Kelly films are something quite different. Kelly is known for having made Finisterre in 2003 (co-directed with Kieran Evans and in collaboration with Saint Etienne) – a bizarrely narrated slide show consisting of an endless sequence of close-up shots of almost recognisable London landmarks. It features voice-over interviews with some of the capital’s favourite cult figures (ATV’s Mark Perry) and art stars (Julian Opie). It is a slow hypnotic film set to one of Saint Etienne’s most ambient albums. Here, Kelly has been able to adapt his visual style to something more suited to the raucous post-punk pop of Dolly Mixture. Formed in the late 70s, Dolly Mixture somehow garnered some press and a few top support slots (The Undertones, The Jam) and were even signed to EMI off-shoot Chrysalis, who tried to capture the band’s punky/poppy girl-group style with a decent but uninspired cover of the Beatles/Shirelles classic ‘Baby It’s You’. Despite the failure of that and all subsequent releases the band found fame (with many memorable Top Of The Pops performances) as Captain Sensible’s backing band on such hits as the UK number one ‘Happy Talk’, ‘Glad It’s All Over’ and ‘Wot’! Their association with the Damned guitarist’s novelty pop may have harmed their career, although if truth be told there are many many reasons why good bands get ignored. The band self-released their sole album (a 27-track double disc) before breaking up in 1984. This story was told in a BBC documentary made at the time, which was screened as part of one of Bob Stanley’s previous Barbican film seasons. It’s claimed that despite their lack of success the Dolly Mixture were influential – I am not sure this is true. If Dolly Mixture had any lasting influence then surely music today would sound better than it does. It does seem as if Saint Etienne are making and promoting films about themselves and their friends – it might be approaching self-mythologising but, hell, someone has to do it. The sad truth is that Dolly Mixture should have been influential, should have been more successful and should be remembered (and still listened to). 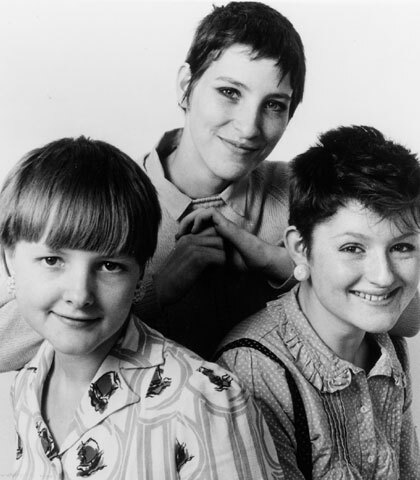 Dolly Mixture were a great band; Debsey Wykes’s voice was smooth as Cadbury’s caramel (Tracey Thorn take note); they had more great tunes than The Go-Go’s; and certainly had more star quality than Bananarama. They could have been bigger than The Bangles.